Hillbilly-Music.com - Go, Cat, Go! One of the last living pioneers of rock, Carl Perkins is best known as the man who wrote "Blue Suede Shoes," the song that galvanized a generation of teenagers and redefined the honky-tonk music of his native South for the pop mainstream. His life story, though, is much more than the saga of a megahit. Born in a three-room shack in rural Tennessee, Carl Perkins was the son of a sharecropper whose family worked the cotton fields. The stirring music of his black co-workers struck a chord in the young Perkins, and while practicing his guitar to the music of the Grand Ole Opry on the radio, Carl realized that "country music needed the black man's rhythms." When he finally formed a band with his brothers, the music they played was equal parts blues, bluegrass, and country-and it drew crowds of white workers to the 'tonks where they let loose after a hard day's work. Eventually, though, Perkins realized he had to light out for Memphis to make his name. It was there-at Sam Phillips's Sun Records-that Carl and Elvis Presley became friends, and they were oined on the road by Johnny Cash for history-making tours of the South. 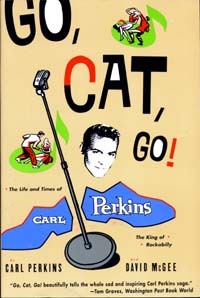 Perkins's lie then alternated between musical success and personal misfortune, but lessons learned in a life lived full measure gave him the strength to overcome his own trials with alcoholism, cancer, and family tragedy, and to carry on with songwriting and performing even in his darkest hours. Go, Cat, Go! is a heartbreaking and exhilarating testament to a living legend, a country boy who played a pivotal role in a musical revolution. Carl Perkins continues to tour with his sons, and to raise funds for the Carl Perkins Center for the Prevention of Child Abuse. He lives with his family in Jackson, Tennessee. David McGee is a regular contributor to ROLLING STONE and a senior editor and columnist for Pro Sound News, and he served as an assistant curator for the Rock and Roll Hall and Museum. He lives in New York City.